A new trailer for Rage 2 will debut at The Game Awards 2018, the game’s official Twitter account announced. Rage 2 is due out for PlayStation 4, Xbox One, and PC in spring 2019. The Game Awards 2018 will broadcast live on December 6 at 5:30 p.m. PT / 8:30 p.m. ET via YouTube in 4K resolution, Twitter, Facebook, Mixer, Steam TV, PlayStation 4, Xbox Live, IGN, GameSpot, Polygon, MLG, Caffeine.tv, and more to be announced. It will feature more than 10 new game announcements, plus updates on existing titles. 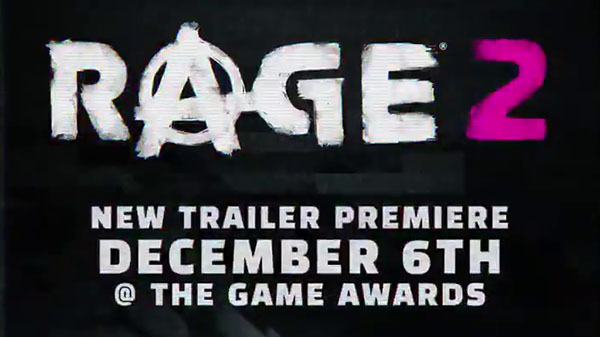 Watch a teaser for the Rage 2 Game Awards 2018 trailer below.